The fourth edition of DocoClub curated by documentary maker Cavell Schipp. Farmland is becoming more and more valuable and scarcer. Every year we lose about 12 billion hectares of farmland through soil sealing. After the financial meltdown in 2008 the global financial capital discovered the business segment of global farmland. Through land grabbing the rich of the world want to secure access to the world’s most important resources. Consequently, instead of farmers, profit is put before soil. If we don’t stop the raids, we will destroy our livelihood. LAND GRABBING portrays both investors and their victims. Their self-image could not be more different. They speak of healthy economics, of safeguarding food supply and of prosperity for all. The others tell about eviction, enslavement and the loss of their economic base. LAND GRABBING narrates the consequences in big pictures. Soils have been levelled on a grand scale for GPS-controlled machines, the consumption of water, chemicals and energy is enormous in the agricultural industry. For each energy unit used in industrial farming, only three energy units can be harvested, with smallholder agriculture it is seven times the amount – 23 energy units. LAND GRABBING shows the dimensions. An area half the size of Europe has already been snapped up, farmers and indigenous peoples have had to yield. Instead of growing food for the region, the farmland is used for large-scale production for the markets of prosperous countries. LAND GRABBING tells us what this has to do with us. It is the EU programs which lead to mega plantations for green fuel and sugar production. And it is with development aid money from Austria the superrich hedge their investments. 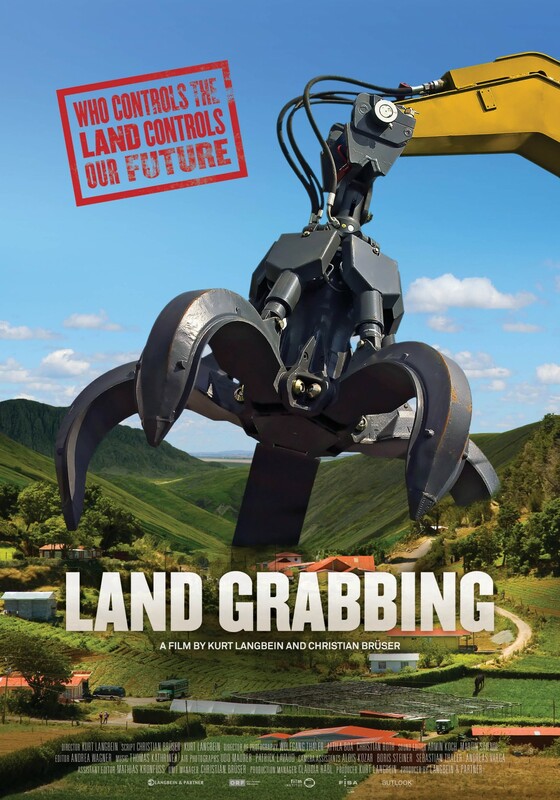 LAND GRABBING causes a stir, gives food for thought and inspires direct action. Resistance against “land-grabbing” is getting stronger and louder. Kurt Langbein, born in 1953, holds a degree in sociology from Vienna University. 1979 – 1989 documentary filmmaker and feature-journalist with ORF (Austrian Broadcasting Corporation), 1989 – 1992 Austrian news editor with the news-magazine „profil“, since 1992 at „Langbein & Partner Media“ as CEO and producer and director of several documentaries and TV-reports. Writer of several non-fiction books (e.g. Bitter Pills 1983, Guidebook to Healthfulness1986, Prolonging Life – At What Cost 1994, 1996, The Medicine Syndicate 2003, Medicine: Classified Information 2009, Pushing Down Daisies – Life After Cancer 2012). 2011 he was awarded the Leopold Ungar-Prize for his TV documentary „The Sense of Endowing“, 2013 he was accorded with the Axel-Corti-Award for Service of Excellence in Broadcasting and TV.